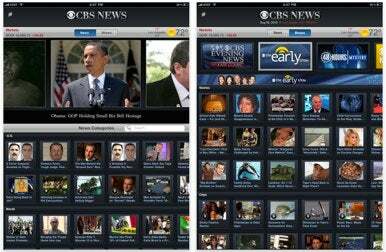 CBS News has released a new CBS News app for iPad. CBS News for iPad features the day’s top stories and provides fully searchable news categories, including U.S., World, Politics, Health, and more. Each category offers rich CBS News coverage complete with a timeline of the latest articles and videos. The app also delivers related stories, videos, and extensive photo galleries, and with one-touch social networking features, users can easily share stories with friends and colleagues via e-mail, Twitter and Facebook. The app boasts a clean, easily navigable interface that customizes content according to your viewing mode; portrait mode offers a rich, graphical experience with thumbnail images and videos, while landscape mode is more text-specific. Other features include realtime AccuWeather-powered weather reports targeted to your location, as well as the ability to download and store content for offline viewing later. CBS News for iPad is a free app and runs on iOS 3.2 or later.